This approach has a lot of possibilities and can open up new doors in writing riffs and solos. Tapping melodies and chords at the same time can help you find new to space to live in on the guitar. 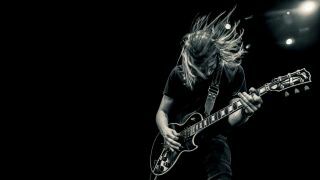 Learn how to create several different arpeggios by slightly altering one of the most common sweep picking patterns. Learn how to add chromatic runs to your sweep arpeggios. A great way to rearrange the pentatonic scale into a two string-speed pattern. Pick up a unique speed-picking technique that was used in countless Van Halen songs. Combine string skipping and tapping for a modern way of playing arpeggios. Learn this very effective and fun way to sweep pick without playing arpeggios. Expand your sweep picking skills by adding slides to create a chaotic, whipping sound. Today, GuitarWorld.com presents the exclusive premiere of State of Mind, the new album by Citizen Zero. Citizen Zero Premiere New Song, "Go (Let Me Save You)"
Today, GuitarWorld.com presents the exclusive premiere of "Go (Let Me Save You)," a new track by Citizen Zero. You can check out the lyric video below.